A massive, Hezbollah-inspired protest involving tens of thousands of Lebanese and Palestinians occurred in Beirut shortly after Trump announced he would move the U.S. Embassy to Jerusalem. The protesters could be heard chanting that America was “the Great Satan” and Israel “the little Satan”. The Hezbollah leader Hassan Nasrallah gave a speech at the rally calling on all nations in “the Arab and Muslim worlds” to cut ties with Israel and close all Israeli Embassies. Nasrallah said he hoped that this action by Trump would mark the beginning of the end for Israel. Even President Recep Tayyip Erdoğan of Turkey called Israel a “state of occupation and a terror state”, saying about Jerusalem that “we won’t leave it to the conscience of a state that only values occupation and looting”. Erdoğan also described Trump’s declaration “null and void” for Turkey. Turkey has been moving away from the West and their membership in NATO and moving toward an alliance with Russia. The Muslim news group Aljazeera worried that the recognition of Jerusalem gives Israel increased boldness. Aljazeera quoted Jewish journalist David Sheen as saying, “We may remember this date as the tipping point, as the moment when a new consensus emerged in Israel behind the idea of total Jewish supremacy” throughout Israel. Aljazeera openly wondered if the recognition of Jerusalem would lead to the ultimate rebuilding of the Jewish Temple. As students of Bible prophecy, we know that this is exactly what is going to happen. David Sheen even tweeted about the likelihood that Trump will also be the one to actually propose the rebuilding of the Temple. He retweeted an Israeli cartoon where Trump visits the Temple Mount and sees the perfect place for the new Temple, complete with American flags. Come to think of it, who would be better than Trump to get the building of the Temple done? 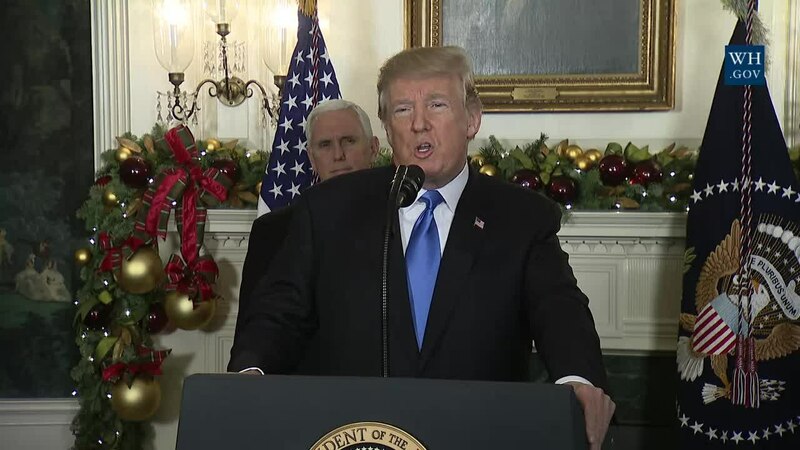 In the wake Trump’s statement to move the U.S. Embassy to Jerusalem, the Palestinian Authority said that they would pull out of any peace talks involving the U.S. as the broker. Trump responded by threatening to cut off all aid to them. The annual aid given to the Palestinians from the U.S. amounts to hundreds-of-millions of dollars. The cutting off of this aid would throw the Palestinian Authority into a state of complete bankruptcy and chaos.